Have you ever thought that you were being followed? I don't do the tourist thing all that often. I live in a place where depending what you are looking for, you can find it. Sometimes you can find what you're looking for in your own town, sometimes you have to get in the car and drive a little bit. I'm about two and a half miles from the ocean. Two and a half miles North of downtown Fort Lauderdale. I could walk to one or the other. I could easily ride a bike or skate to either. Actually, I know my fitness level, I could ride a bike or skate to both in one afternoon since that isn't really that big of a workout. Nothing quite so exciting that day. I just wanted to go out to Wilton Drive. With in a leisurely stroll of the house there are quite a few shops. I actually am looking for something that you would want to get at a thrift shop, and we have three of them within about a half mile of where I am sitting right now. I wanted a Pizza Steel. I didn't find one. A Pizza Steel is a slab of metal that you put in your oven. Turn the oven on to "Good-And-Hot" and let the oven come up to temperature. Then you slide your pizza onto it. Anything you cook on that would get a crispy bottom. Since I hadn't found one, I have been using a rather thick aluminum cookie sheet. It works, but I'd prefer more "mass". So I left the house. 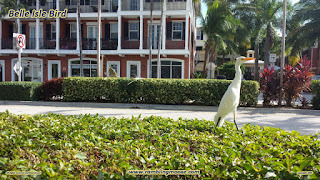 Noticing that there was this goofy white bird feeding on the lawn across the street, I started heading out to The Drive. I didn't think all that much of the bird, we've got lots of wading birds here in town. 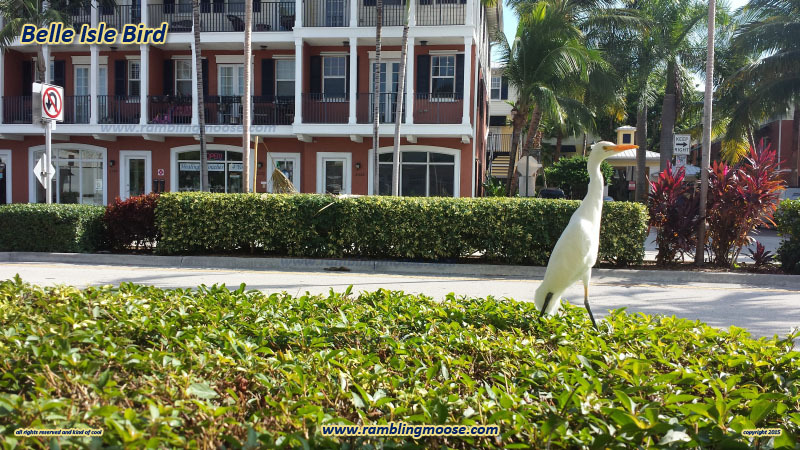 They tend to fly out overhead as the afternoon begins to wane to go out to the Everglades fifteen miles West, or just any other little waterway nearby. There's a lot of water in South Florida to manage, and it has been managed. Badly. I got to the first thrift store, walked in, did my browsing. No Pizza Steel. Nothing I could hack to use as a Pizza Steel. I did notice that there was another one of those white birds standing there in the lawn feeding, and watching me. Thinking, that's odd but harmless, I headed to the second thrift store. Still no Pizza Steel. Damn. But there was a bird again. Ok, this is getting weird. I walked a little closer to it and it watched me. Deciding that neither of us were getting anything out of this bird watching, I headed to the last thrift. This one is the one that is there to benefit the animals, and as a result I like to shop there whenever I can. But no Pizza Steel. I'll have to keep using the cookie sheet. It is a very thick aluminum sheet, and will crisp the bottom of the pies, but it isn't quite what I want. You guessed it. When I headed out, my bird was back. Now, I can't tell one from another. They're all paper white with orange beak and bright eyes that watch you back. It was a strange coincidence. It just stood there, on top of the little hedge watching me. Now, to anyone else, these birds are wary. They'll waddle off when you come near or even fly away. Not this bird. It waited for me to get as many pictures as I wanted. Standing there on top of the hedge, it seemed to like the attention as I fired off more pictures. Sure, little white bird. You're happy to be seen. I guess it knew I was harmless. What got me though was that coincidence. We've got quite a few of these birds around. They're like Starlings up North sometimes. You'll see great herds of them hunting for grubs in the lawns, especially untreated lawns. But four separate shops on a heavily traveled road with little greenery? Where's Alfred Hitchcock when you need him. I think I have a story idea for him. Oh wait, it's been done?